Here is something that would instantly find its way into the shopping lists of budding and professional musicians. 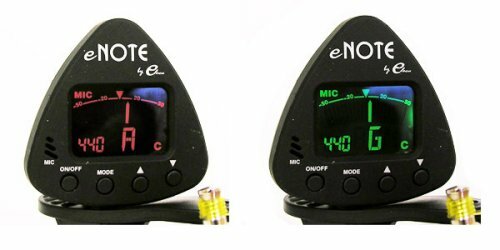 The eNote Digital Tuner from ELECA will put all difficulties regarding tuning musical instruments to rest. This little gadget will tell you, when your note is correct by turning the display green. You simply need to know what note corresponds to each string. For which ever key the instrument uses, the tuner will help the user find the note for the string. To use the instrument, one simply needs to attach it to the musical instrument. It is compatible with guitars, violins, banjos, dulcimers and other stringed instruments. So, go ahead and give the musician in you another reason to celebrate. Set parties and stages on fire with a perfectly tuned music! $25.00 is a small price to ask for something so effective a guide!